Genie has introduced a new accessory, the Expo Installer is designed to make boom lift operators more efficient by allowing for precise, easy placement of signs, banners, and hanging décor. The accessory is great for use in convention centres, arenas, shopping centres, and other locations that utilise suspended ornamentation. 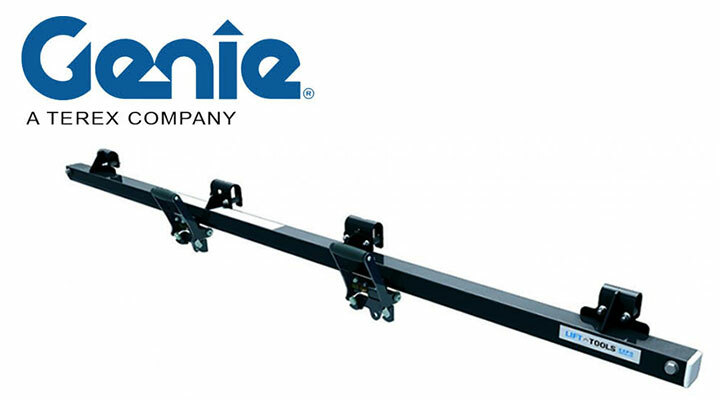 The Genie Lift Tools Expo Installer is an indoor-use only aftermarket accessory, available through Genie Genuine Parts, designed for 6-ft. and 8-ft. articulating and telescopic boom platforms. Similar in design to the Genie Fall Arrest Bar accessory, this productivity tool uses a sliding track design with two trolleys that can carry a combined capacity up to 240 lbs. and can be used with various rigging types. When lifting to height, brake pads secure the trolleys from sliding when the machine is in motion. The Genie Lift Tools Expo Installer can be attached quickly and easy to a boom platform by one person in approximately five minutes. The installer is currently available in North America. It will be available in select areas of Europe, Middle East, Africa, and Russia in the future, pending country-specific regulations approval. For more information, please visit genielift.com.